For the first time in 72 years, the Boston Red Sox reached a 100-win season. With 16 games left to go, the 2018 Sox are only five games from tying a franchise-best season record. With the way this team performed this season, it’s no surprise that a team led by two MVP candidates in Mookie Betts and JD Martinez, along with Cy Young candidate Chris Sale, are the first team to 100 wins. Alex Cora is the fifth manager in MLB history to win 100 games in his first year as manager, according to ESPN Stats & Info on Twitter. Should the Red Sox go at least 10-6 in their last 16 games, Cora would have the most wins in MLB history by a rookie manager. Alex Cora is the fifth manager in MLB history to win 100 games in his first year as manager. However, the most surprising part of this season is the lead Boston amassed against bitter rivals, the New York Yankees, a team that was supposed to dominate this year. With a 10-game lead over the Yankees, Boston clinched a playoff birth and need only seven more wins to clinch the American League East. With six of their 16 games left against the Yankees, the Red Sox could get an even bigger lead on New York and give their hated rivals an away wildcard game in the playoffs. Looking ahead into the playoffs, the Red Sox could face some tough opposition. The Cleveland Indians are without a doubt clinching a playoff spot, with a 14.5 game lead on the Minnesota Twins in the AL Central. In the AL West, however, the Houston Astros and the Oakland Athletics are only three games apart. The Red Sox have struggled against each team and will need their bullpen to finally get it together for a comfortable World Series push. 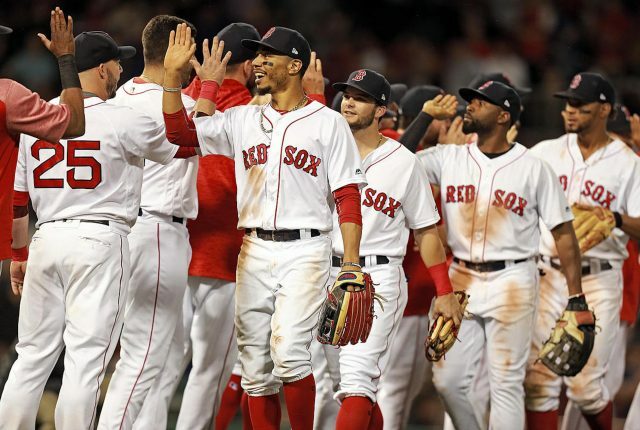 Should the Red Sox manage to win the rest of their games, they would tie the MLB-best season record of 116 wins, achieved by the 2001 Seattle Mariners and the 1906 Chicago Cubs. Baseball is baseball though and the odds of that happening are extremely low. The Red Sox face the Toronto Blue Jays Thursday night in Boston at 7:00 PM for the last of a three-game series before the New York Mets make the trip to Boston.